There is of course nothing wrong in celebrating America’s heritage with displays of the flag, especially on the anniversary of our national “birth,” but notice here how the elongated flag (one of three U.S. flags in the photograph) is completely out of scale with its surroundings—both in size and dimension—as if to imply that there is nothing that can’t be covered by its reach. Such hubris is accented by the military fly over and honor guard which frame the image across the diagonal from upper left to lower right. Though barely conspicuous in comparison to the magnitude of the flag, the martial presence in the image nevertheless emphasizes the normalization of a war culture in American life, even as the flag serves to articulate commitments to nationalism and militarism as if naturally and necessarily connected. Photo Credits: Elsa/Getty Images; Kelly Presnell/AP/Arizona Daily Star. Is the occasion of the Boston spectacle necessarily ‘militarism’, or could it be solidarity with our servicemen? Are the flag’s proportions hubristic, or defiantly jubilant? (Defiant, not only of circumstances, not only of policy; defiant also of certain rhetoricians and quibblers.) Could the fly-over represent our troops passing by, always on duty, doing the work of defense while we drink beer in the sun? Perhaps the death-flag given to the child represents a piece of what we are, without which we could not be. We are not normalizing a culture of militarism when we make a tiny symbolic gesture to show our love and gratitude to a grieving widow; we do it because she is in pain, and we are in pain, with her. I think you got a lot wrong in your commentary. Why and how could you be so wrong, wrong in an ideological way which is so common and so disastrous for the United States? Any symbolic unity, any sharing of spirit, it is immediately regarded as suspect, faces always, not sincere scrutiny, only practiced derision. That is the question I’m left asking myself after reading this weird piece. That, and what was the Specialist’s name. David: The problem with your argument is that it operates with an assumption that the images actually defy: that we can somehow easily or effectively separate the “serviceman” from the “military.” We can’t, but the assumption makes it all too easy to dispose of any critique of a cultural militarism as a mere “quibble,” or worse, as a “disastrous” (unpatriotic?) attack on the men and women who protect us while we “drink beer in the sun”– as if patriotism were somehow tied to support of the military. Quite frankly, it is that position that I find the more pernicious and disastrous for a democratic society that relies on the possibility of unfettered dissent. And for the record, my critique is NOT of symbolic unity–much to the contrary–but of a pervasive, normalizing attitude that makes it impossible to separate our commitment to flag and nation from the military as if the only way to be patriotic is to support a normalized militarism. As to particulars. 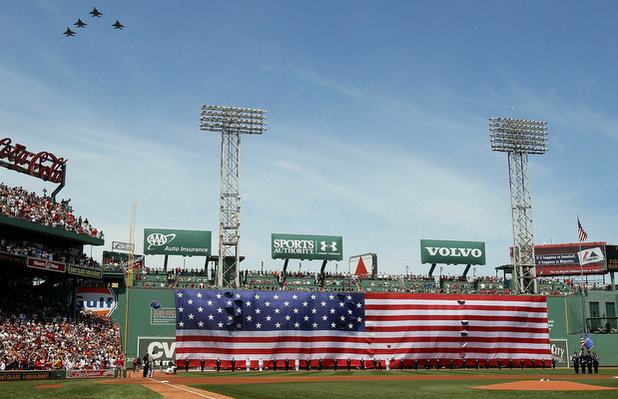 I am not at all sure that I follow your claim that the elongated flag in Fenway is more “defiantly jubilant” than hubristic, largely because there is nothing in the image that signals defiance of any sort. 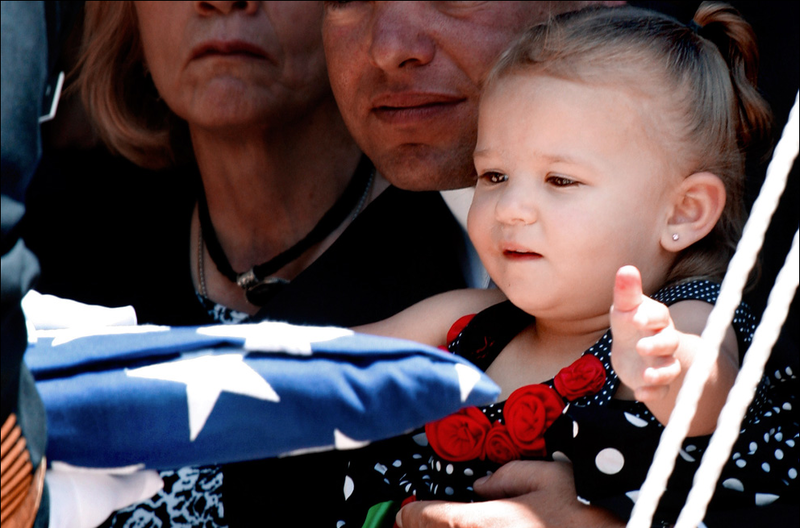 And I would agree that showing “our love and gratitude to a grieving widow” is a humane gesture that should be honored, but notice that in this image the flag is not being given to a grieving widow but to a child who shows no signs of grieving. Being wary of that is not “practiced derision” but sincere concern for the future of a nation that seems so easily to outreach its grasp. I am trying to work through distinctions between “Americanism,” American “nationalism” and “American Exceptionalism.” I think the God Bless America moment is indeed AE. The conflation of (christy) religion with national praise is clearly within the Reagan image of AE (though I’m not sure it is consistent with Toqueville, whose use of the term is not linked to a special relationship with a deity). The question for me is when does nationalism turn to exceptionalism? (By nationalism here, I am not thinking of jingoism, but rather a general and moderate pride in the nation, wanting the US to win in the World Cup or the Olympics, or being proud of where you are from). I think that as a nation we often Americanize (nationalize) ideas and material objects; but there is a point at which we cross over into exceptionalism and this is (or grey area) where reflexivity is lost. Thought is replaced by ritual and skepticism by dogma. I was in the Holocaust Museum in Washington DC last week, there is a temporary exhibit on Nazi Propaganda (an incredibly anti-rhetorical exhibit). In the comment book outside the exhibit visitors wrote only two types of comments. One, that the Nazi propaganda machine was horrible and is what the Obama administration is doing to us now, and, two, that Nazi propaganda is echoed in contemporary advertising and political campaigning. The point is, that the national discourse often fragments along these same love-it-0r-leave-it lines. The distinction between exceptionalism and national pride seems at times to be minute and at other points, a chasm.